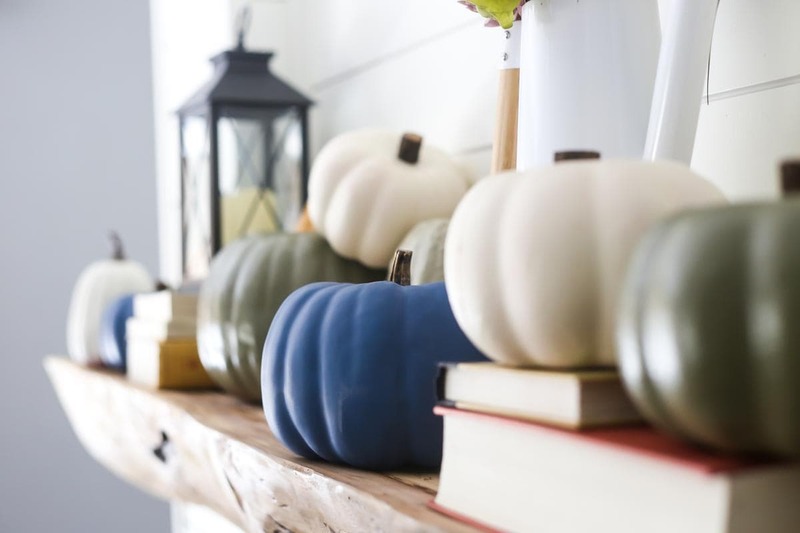 Looking for fun fall crafts to spruce up the fall decor in your house? 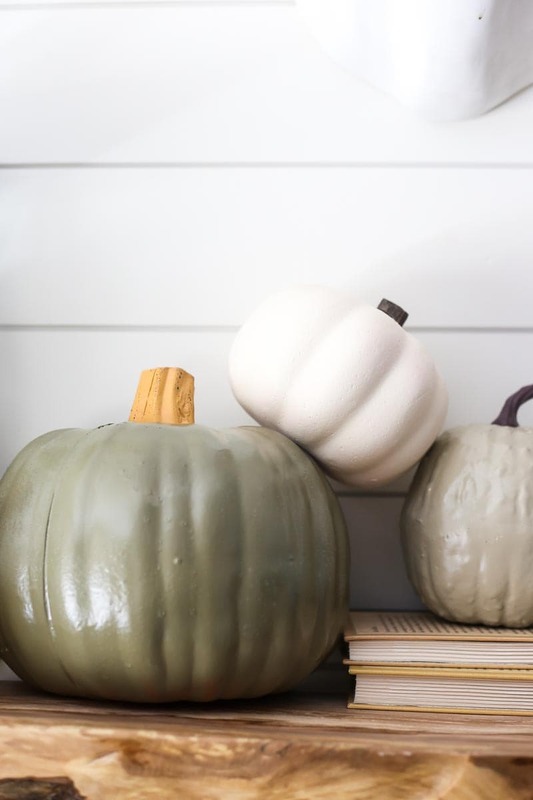 These easy DIY faux pumpkins are a really great fall DIY – and they’re made with dollar store pumpkins! This post is sponsored by Rust-Oleum, but all opinions are mine. Thanks for supporting the brands that support Love & Renovations! 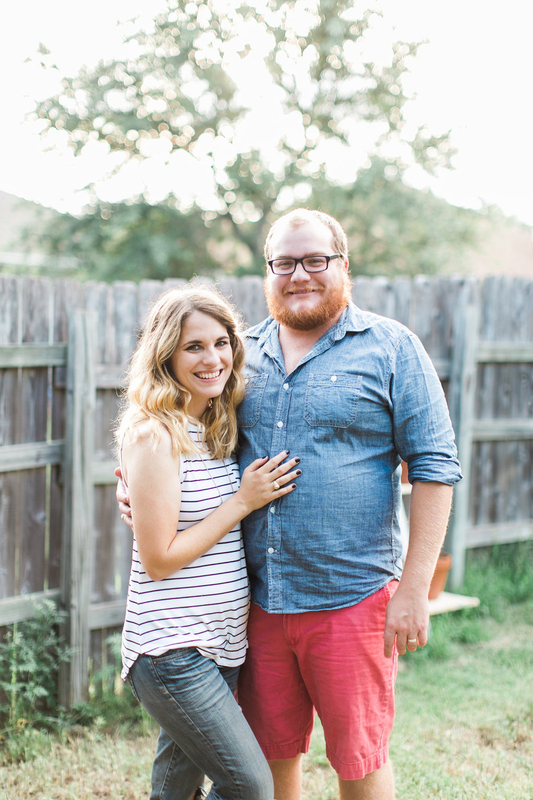 I’ve lamented a bit here and there on the blog lately about how Corey and I didn’t really get a chance to decorate for fall this year. We’re prepping for a big move, and between staging, organizing, and getting projects done we just didn’t have the time or energy to do a lot of decorating. Plus, a fall explosion doesn’t exactly lend itself to neutral decor for house showings, now does it? But, thankfully, all of that is over and we’re now officially in the “waiting zone” of moving – we move in just a few shorts weeks and are in the midst of packing up everything we own. And the waiting zone? Well, it’s the perfect time to do a little decorating. 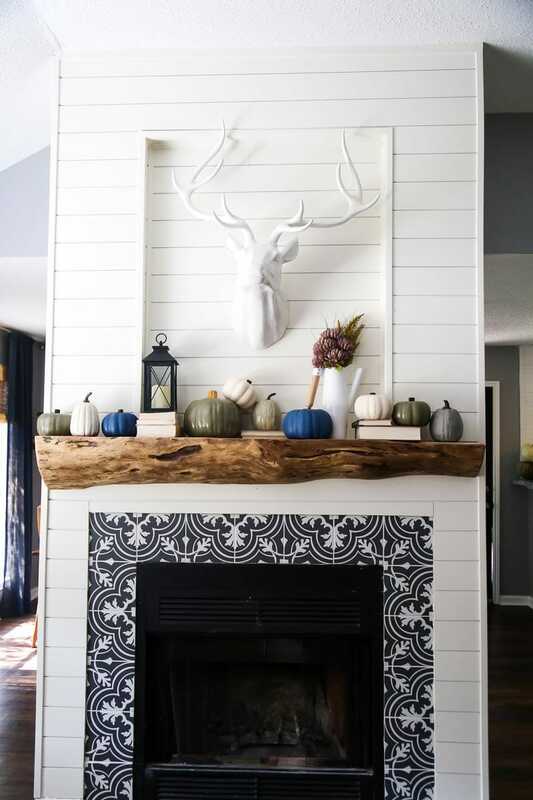 And when my friends at Rust-Oleum told me that they were looking for some fun mantel projects for the holidays, I knew pretty much immediately what I wanted to do. 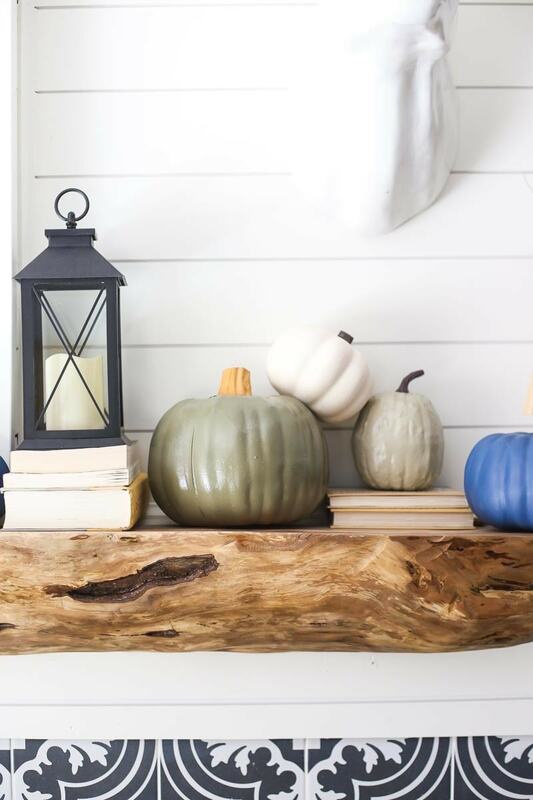 Because my gorgeous, brand new mantel was just begging to be stuffed full of pumpkins. If you love this idea, don’t forget to pin this post for later! I’ll admit, when I first got started I wasn’t totally sure how this would turn out. I knew I was working with pretty cheap, low-quality materials with these little ol’ pumpkins, and I was a little concerned that they’d still look cheap even with the paint. Thankfully, there was nothing to worry about. Because they look amazing. 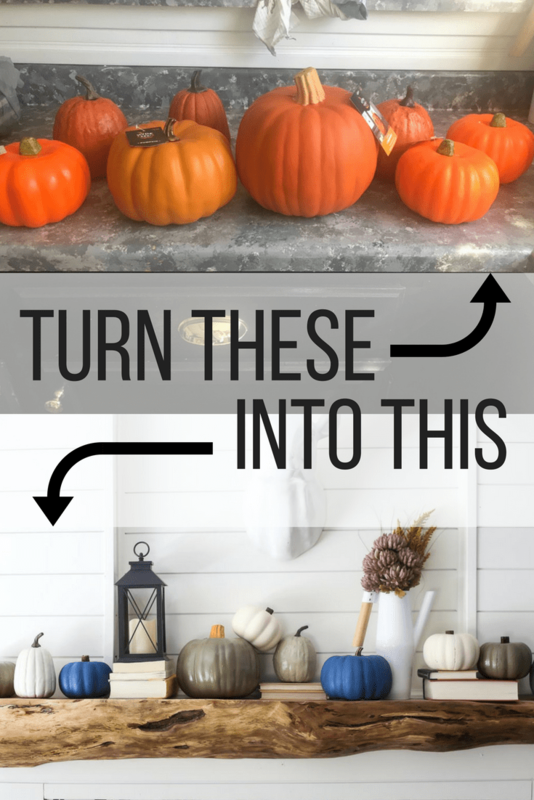 I was pretty surprised at how difficult it was to track down affordable faux pumpkins – the first dollar store I checked didn’t have any pumpkins at all, so I hit up the craft store. They had faux pumpkins, but they were at least $10 each, which was more than I was willing to spend. At the second dollar store, I finally managed to track down some small faux pumpkins for just $1 each. 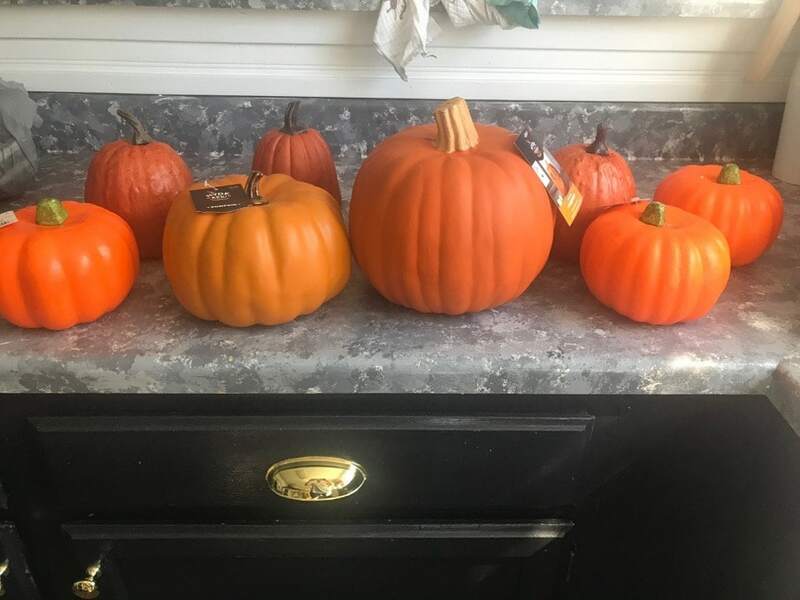 I headed to Target last, and I found the rest of the pumpkins for anywhere from $3 (for the smaller ones) to $8 (for the largest one). Once all was said and done, I spent a total of about $35 on all of the pumpkins, which I’d say is a pretty amazing deal for a mantel full of pumpkins. To paint the pumpkins, I used a variety of colors of Rust-Oleum spray paint. If you’ve been around for any length of time, then you’ll know I’m a huge fan of Rust-Oleum for all things paint, stain, and finishing. They really do know their stuff, and their color selection is incredible. Oh, and did you know they’ve got Chalked spray paint now, too? As in, chalk paint. In spray form. Yup, it’s a thing. And it’s pretty wonderful. I wanted to go with a more neutral color scheme (kind of like I did for our fall tablescape) for the mantel this year. 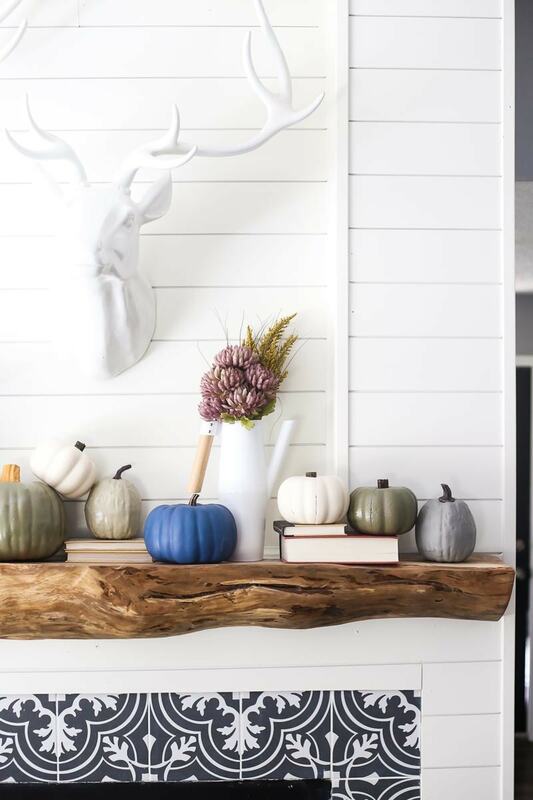 I’m not a big fan of the “traditional” fall colors, but these blues, greens, and greys flow right into our normal decor and feel like they actually belong in our house. I’ll list the actual colors that I used below, but I was shooting for a good combination of neutrals with some blue and green thrown in for a deeper color. This is a color scheme I’ve really been gravitating to all season long, and I think it’s one I can live with for many falls to come. I’m definitely thinking that next year (when I won’t be moving and can actually decorate a bit more), I’ll be making a lot more fall decor in this general scheme! Here’s a quick list of all the colors I used for these. So, what all did I actually do? Well, I started off by pulling off the stems from each of the pumpkins (except for the largest one, which was an actual part of the pumpkin, and not attached with glue like the others were) and setting them aside. For the one that was fully attached, I just taped it off so it wouldn’t get paint on it. Then, I grabbed my spray paint and got to work. There’s no special technique here – I just spray painted them like I would anything else. 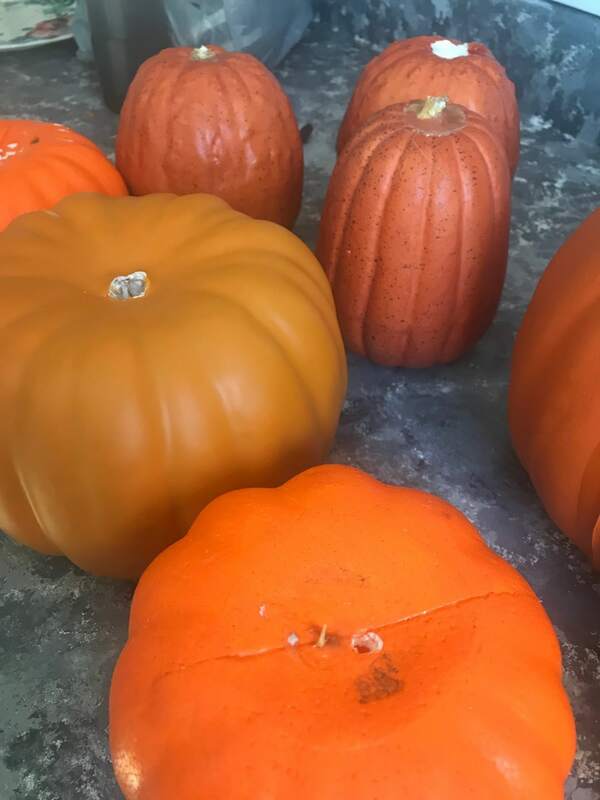 I didn’t want any particular texture or aging – I just wanted some pretty, non-shiny pumpkins that might look like they were pulled straight from the pages of a magazine (because I’ve never seen a real-life pumpkin patch that actually has pumpkins with this many gorgeous colors). I did two coats on each pumpkin (and I flipped them over in-between each coat so the bottom would be painted as well), and once they were all nice and dried it was time to re-attach the stems. The pumpkins I got from Target actually had some good, realistic-looking stems. So, I decided to leave them alone and I just shoved them back into place with a little hot glue to keep them in place. The dollar store pumpkins, however, had stems that just couldn’t be saved – so instead, I went into the yard and grabbed some sticks. I used my miter saw to cut them down into roughly 1″ sections (learn how to use a miter saw here), then I used my hot glue gun to attach them. They look much better with the “real” stems, and you’d never guess these were only $1. I haven’t played around much with different types of spray paint prior to this project – most of the time, when I’m spray painting something I want a nice glossy finish. 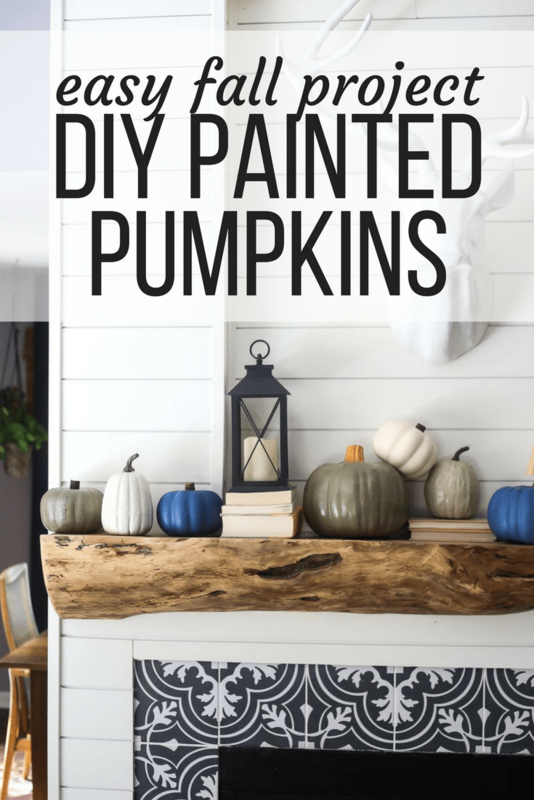 But, I definitely didn’t want glossy pumpkins for this project, so I branched out a little and tried some satin and chalked paint. I’m so impressed with the finish on them, and I think it makes all the difference. I’ve also never used chalk paint before – it’s just not something I’ve ever gravitated to before, but this project was the absolute perfect time to try it out. 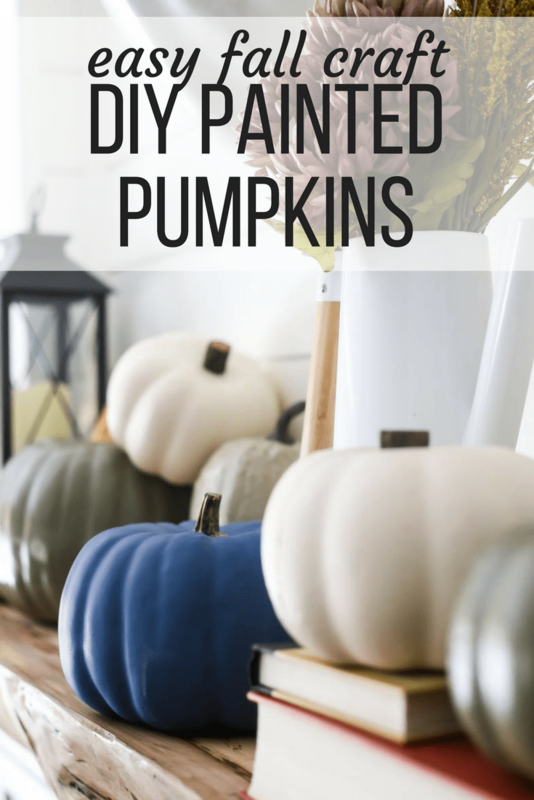 I’m obsessed with the matte finish, and I think it looks so, so good (the blue, white, and gray pumpkins are all painted with chalked paint). I think I’ll definitely have to try it out again soon – maybe on something bigger next time. I’m so in love with how these turned out, and it’s really got my brain churning for other ways I could use dollar store pumpkins. I’ve seen some really cute projects where people have hollowed them out and turned them into planters, and I know someone who carves the Target ones like a regular pumpkin so they can keep them after Halloween is over! Also, now that I know chalked spray paint exists, I’m probably just going to be chalk painting everything in my life. So be ready for that. 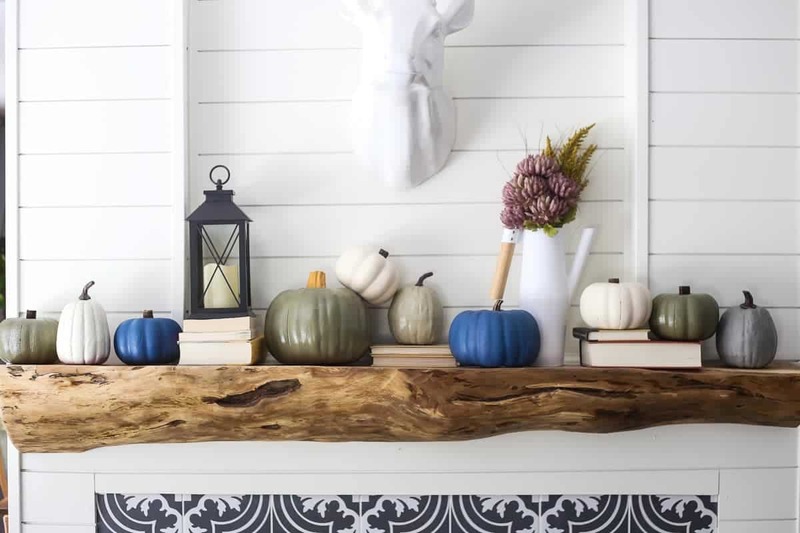 How have you decorated your home for fall this year? 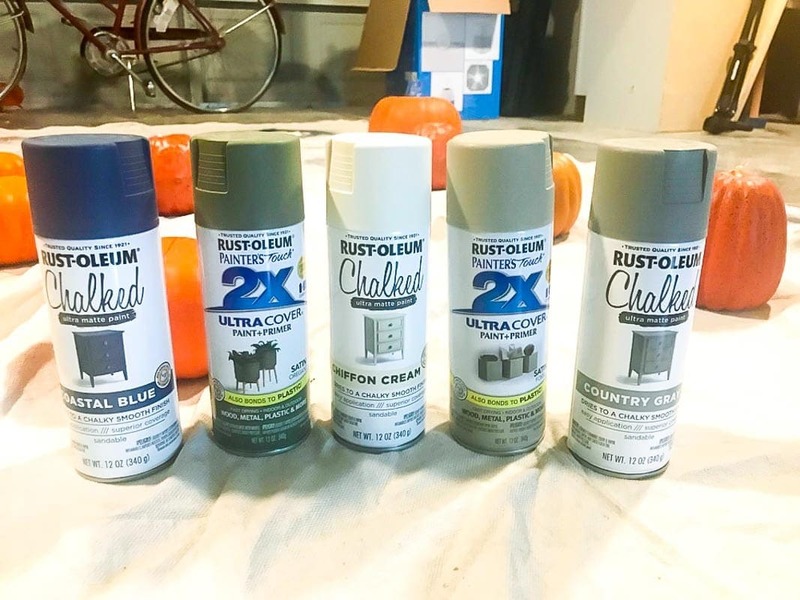 Be sure to check out Rust-Oleum’s amazing spray paint if you want to try to make some easy DIY pumpkins of your own! I love those colors and the way you styled your mantle. Happy Thanksgiving!